I’m surprised that the man who co-authored the reproduction on De arte gladiatoria dimicandi doesn’t work more with the hallmarks of Vadi. It’s a fair question, and suggests that in 2001, when I was working on my edition of Vadi, I did not yet have enough understanding of the larger dei Liberi tradition to separate Vadi’s brilliance from the marketing hype aimed at securing him a position at the court of Urbino. While Filippo Vadi defines his art as “newly made”, and specifically draws attention to several supposedly unique features, a study of his work against Fiore dei Liberi’s shows that this is a bit of clever marketing on Vadi’s part. As such, Vadi’s value is not in the tweaks he provides to the mainline of the art, but rather in his often detailed explanations of the art’s fundamentals and theory. A recent email from one of my students asked about Filippo Vadi’s innovations and his role in the dei Liberi tradition, and how they influence what we teach at the CSG. These were such excellent questions that I thought I would share them, polish up my replies and post them here. This comparison gives us a good idea of why Vadi is clearly within the dei Liberi tradition, yet distinct from the root, and it tells us what learning to fight from one of Fiore dei Liberi’s students might have looked like. It also helps explain why we have multiple texts by the Bolognese masters, all within about a 40-year period, and although the art is the same, no two of them use the same, precise combination of guards or emphasize exactly the same things. I’m aware that our working understanding of Fiore, and medieval swordplay in general for that matter, is not completely and wholly taken from Fiore’s treatises alone. Our understanding is a composite of other concepts borrowed, or better explained, by other masters such as Silver, Manciolino, Vadi, di Grassi, etcetera, contextual period research, all glued together with some basic biomechanical principles that are found in all martial arts. Our knowledge of Fiore’s art is greater because of the contributions of these other masters and vice versa as they “fill in some of the gaps” that are not laid out in each and every text. Correct, but note that we reference those texts only in so far as they add clarity, or provide a viable answer to what cannot be answered by what is in the five dei Liberi Tradition texts (Getty, Morgan, Pisani-Dossi, “Florius”, and Vadi). But what befuddles me, is that the CSG teaches Fiore – but with what seems to me, the glaring anomaly of Vadi’s Posta di Falcon. Most certainly we use concepts as laid forth by Vadi (such as mezzo tempo and working from within the bind) that help us better understand Fiore, but we seem to go about it like we’re learning solely the art of Fiore in class. It has been hastily explained before to me that Falcone is included in what we do because Vadi is ostensibly a continuation (or further evolution) of Fiore’s work. Wouldn’t a more applicable label be then, Fiore’s art as seen through a student of Vadi? But yet this doesn’t seem to be true either. This is and isn’t true. Once upon a time, posta di falcon, which is itself simply a variation of the mainline posta di donna, was used far more extensively in the novice curriculum then we use it now. But if you look at core Guild curriculum, it does not appear in most of the guardia drills, nor is it used in the various set-plays any more. It is something that students are exposed to in the introductory classes and then see little more of. So why is it still there at all? Although posta di falcon is in practice a variation of posta di donna, it behaves with very different timing and line than the latter. (Nor can it place the thrust the same way.) It is also analogous to the “high vom Tag” used by German fencers or the guardia alta of the Bolognese school, which are the two major counterpart traditions to Armizare. So, for the novice student, it is shown to explain the evolution of a “high guard”, and in part so that they can play with the mechanical differences and be familiar with them when encountering students of other traditions. If we’ve been learning “Fiore’s guards + Falcone,” then why do we not include Vadi’s other guards that are unique to him, like Posta Sagitarius or his Posta di Chinghario? Vadi also omits certain guards that Fiore shows (Posta di Donna la Soprana, Coda Longa, Dente de Chinghario lo Mezzana). More confusing yet is when I look at Vadi’s guards, some share the names of Fiore’s guards but are framed and pictured in a way reminiscent of an entirely different guard (example: Vadi’s Posta Longa looks like Fiore’s Posta Breve). Boy, is there a lo t to answer in what seems a simple observation! Since it seems that Vadi radically reworked the guards, and since the art is based on movement from guard to guard, this must mean that he radically altered the art itself, right? Maybe not. Let’s begin by looking at Vadi’s list of sword poste. He presents twelve key positions for the longsword, whose names and descriptive rhymes are often similar, if not identical, to those of Fiore dei Liberi’s Flos Duellatorum, the Pisani-Dossi Ms, which Vadi’s work most resembles. 1. Mezana porta di ferro Same name and position as the guard shown in carta 18 A. 2. Posta di donna Same name, and similar, but not identical to the “posta di donna” shown in carta 18 B. 4. Posta di falcon No parallel, the position is unique to Vadi. 5. Posta breve Same name and similar position to the position shown in 19 A. However, Fiore shows the guard with the left leg forward and the point raised. 6. Posta sagitaria The position is similar to a lower and more forward version of the “posta finestra” seen in carta 18 A. 11. Post frontale Despite the name, no definite parallel. 12. Posta di cinghiaro No exact parallel. The position resembles that of the denti di chinghiare, above, but with a left leg lead. Part of Vadi’s goal may have been to show his art as unique, which is certainly how he promoted his work to the court of Urbino. Another possibility is that all of these guards likely originated from older sources. The Bolognese masters also used coda longa (or properly, coda longa e distessa), dente di chinghiale and porta di ferro (but these two terms mean an entire class of guards). Eisenpforte (“iron gate”) and Kron (“crown” – corona) are old German guard names, for the same positions Fiore shows as porta di ferro mezzana (“middle iron gate”) and posta frontale o corona (“frontal guard, called crown”). We have to remember that what we have is a snapshot in time of how the guards look c.1409 in Ferrara, c.1482 in Urbino, and c.1500 – 1570 in Bologna. We have no linking information per se, nor anything on their origin. But as regards Vadi and dei Liberi, in many cases the reader is seeing Fiore’s guards, they just don’t know it. Remember Fiore’s injunction that “all guards make volta stabile and mezza volta“? This is often translated to mean that dei Liberi’s poste have both forward and rear-weighted variations (as he clearly shows with posta di donna and dente di cenghiaro), and left and right side variations. Now, let’s look at Vadi’s dente di cenghiaro on Folio 17v. Before we assume that this is a “new” or a “revised” guard, we should ask ourselves how what is shown relates to dei Liberi’s advice. Or does it? What about his version of posta di donna? As to the other poste, while Vadi drops several, he adds none (besides posta di falcon) that can’t be found in one of the four Fiore manuscripts. While his posta di donna looks odd, consider it in light of one clear change Vadi does introduce into the art – an emphasis on attacking with the acressimento, rather than the pass. In this light, the guard’s new form makes perfect sense – it allows the swordsman to strike out with a fast cut made with an advance of the lead foot, followed by immediately retracting sword and foot back into guard. But is this really a significant change to the art itself, or a demonstration of how to use an old, well-known guard while emphasizing the advancing step? The name posta sagitaria is borrowed from one of Fiore’s guards for the sword in armour (of which Vadi maintains six, but renames them), but it is in reality posta di finestra, adapted to the narrower stance Vadi favors. The one that might catch our notice is on Folio 17r, which looks like a poorly drawn posta di donna, but is called posta di vera finestra. This is where we need to remember that dei Liberi’s own poste vary slightly from manuscript to manuscript, and that each manuscript names twelve, not because that is how many there are, but because the number twelve is numerically significant. Vadi’s artwork and captions derive from the same line as the Pisani-Dossi and Florius manuscripts, and there is something very interesting there. Here we see posta di donna as we know it, we have posta di finestra, and then we have the guard Vadi calls posta di vera finestra, which the Pisani-Dossi manuscript calls posta di donna di vera finestra. This is an interesting position, a very old guard that appears extensively in early and High Medieval artwork when the fencer is wielding a buckler or a shield. Dei Liberi shows it again as a variation of posta di donna used with the sword in one hand. This guard looks much like posta di finestra, but has the elbow dropped so that the point is lifted and offline, creating a position that is midway between the “canonical” posta di finestra (point forward) and posta di donna (point refused). In practice, it plays like both of them. This is all academically interesting, but poses an interesting challenge for us as martial artists. We can either add every oddity as a discrete position, teaching about 22 guards in all, or we can follow Fiore’s core advice that there are 12 core poste, teach the 12 that are generally consistent throughout his work, and look at the others as variations of those 12. The Guild uses the latter solution, with the idea that as students progress, they will be exposed to all of the variations, including Vadi’s, and learn how they are used. What about Vadi’s “new footwork”, that narrow stance of his that is shown framing other guards and found in his other plays? As I said above, Vadi shows an emphasis on the acressimento, and he certainly wants us to know that this is a major innovation and “better stepping than the way of our ancestors”. The question is: Can we believe him? 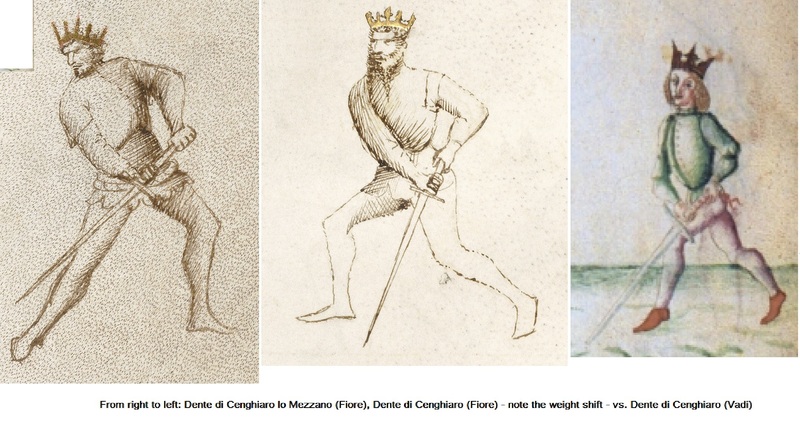 In my opinion, Vadi’s narrower stance, combined with favoring a right foot forward stance on some of his cutting guards shows an early example of the alterations in swordsmanship that we see occurring throughout the 16th century. Armoured harness was falling out of use and unarmoured dueling was becoming more common, ending in the reduction to the four, point-forward, sword-side leading guards utilized by the rapier. This thesis seems supported by how stripped-down the armoured combat portions of Vadi’s De arte gladiatoria is, compared to dei Liberi’s Flos Duellatorum. Of Vadi’s 25 techniques for fighting with the sword while unarmoured, eight are direct reflections of the illustrations and captions found in dei Liberi. Proceeding to the armoured techniques, Vadi reduces and renames the basic stances, but they remain mechanically the same as the earlier masters. 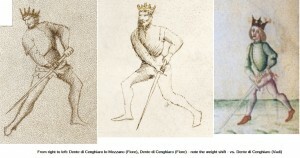 Each of the four poleaxe and five armoured sword techniques that Vadi shows are again directly paralleled in both illustration and text with the Flos Duellatorum. Likewise, although he again has a slight alteration in guards, Vadi’s spear plays derive directly from the work of his predecessor. He then concludes with 47 dagger techniques, including two techniques to be used by a swordsman attacked by a knifeman while his sword is sheathed. As with the sword techniques that began the illustrated plates, many of these techniques correspond directly to the Flos Duellatorum, while the final eight, uncaptioned plays at the very end of his book are presumably of Vadi’s own devising. So, besides his poste variations, there is nothing in Vadi’s technical repertoire that is unique or distinctive, or really, wasn’t apparently copied from another manuscript in the mainstream tradition. Thus Vadi’s treatise does not represent a “new art,” but rather a glimpse into one line of evolution of an established tradition. His focus on the sword as the centerpiece of the art, his alterations of the basic guards to keep the sword more forward of the body, and his promotion of a narrower stance and smaller, faster cuts all prefigure many of the the tactical considerations of 16th century masters at arms, but are ultimately small changes to the system first laid out by Fiore dei Liberi nearly eight decades earlier. So why bother with Vadi at all? We’ll look at what makes the old boy shine in part II.